flavorful rubs on the market. In the recipe and photo above, I’ve used Bone Suckin’ Sauce Seasoning and Rub. It is a blend of brown sugar, paprika, garlic and spices. McCormicks also has a great line of products called Grill Mates—Seafood Rub, Applewood Rub, and Sweet & Smoky Rub to name a few. You can also make up your own rub with seasonings that fit your tastes. Experiment… it’s what makes cooking fun!! – With tweezers, remove any small bones from salmon steaks. – With hands, rub seasoning over both sides of salmon steaks. – Place salmon on hot grill rack. Cover grill and cook salmon 8 to 9 minutes, or until just opaque throughout, turning over once. 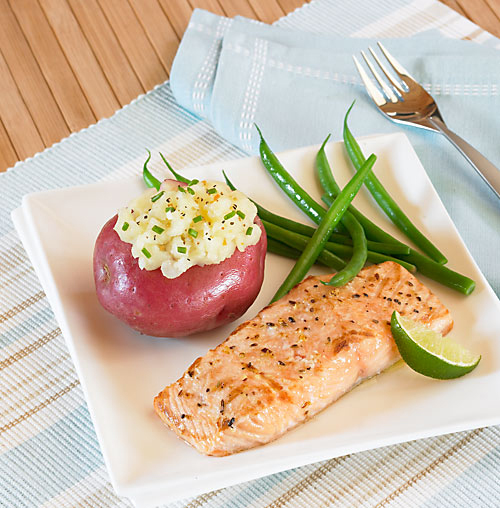 – Salmon is considered an oily fish, which contributes to its healthy attributes. It is high in protein, Omega-3 fatty acids and Vitamin D.
I love salmon grilled or baked with broccoli and new potatoes and I’ll certainly try your recipe. It sounds great and so full of goodness. Love your styling and pictures!